Envision IP has been following the patenting activity in the on-demand car service and ridesharing space over the last year, with a specific focus on Uber’s patenting efforts. 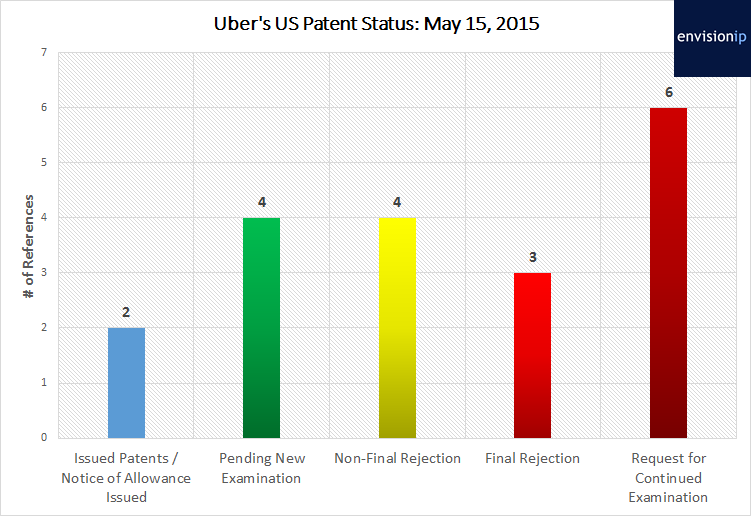 In our report last December, Uber owned 16 published, pending US patent applications, with no issued patents. Since then, Uber has received a notice of allowance (NOA) on a pending application, as well as a design patent. 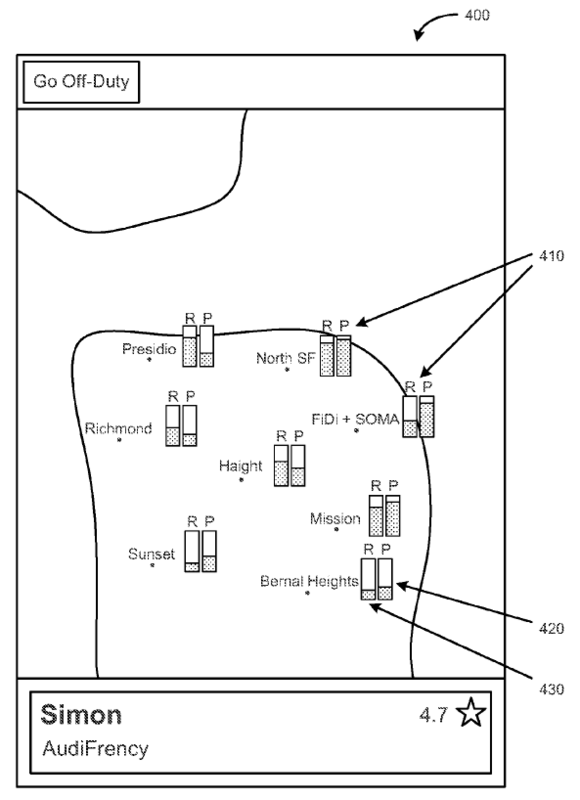 The NOA was issued for US 20140011522, entitled “System and method for providing dynamic supply positioning for on-demand services.” The patent application is directed towards determining an under-supplied service region based on the number of drivers and requesting passengers in an area, and subsequently notifying drivers of these areas. Figure 4 below from the patent application shows a driver interface within the Uber app, where indicators 430 and 420 graphically show the ratio of requesting passengers (R) to drivers/providers (P). An initial look at the file history indicates that the issued claims are relatively broad, and do not appear too limiting, which may provide Uber much needed patent protection in its space. As we reported last March, Sidecar was the only operating company in this industry with an issued patent. Uber’s patenting efforts may prove lucrative if the company can continue to obtain patents on its proprietary technology that are relatively broad in scope, as well as patents from acquisitions, such as its recent acquisition of Decarta. The notice of allowance is an encouraging sign for Uber. The company currently has 6 patent applications in a request for continued examination (RCE) status after receiving a final rejection, 3 which have received a final rejection, and 4 having received a non-final rejection. Uber also has 4 pending applications which have not yet been reviewed by the USPTO. In addition, we believe that Uber likely has a number of pending applications that have not been published yet.